Remember Monday, when we posted about the Supreme x Nike Air Foamposite 1 release and we suggested that anyone hoping to grab a pair "pull out your sleeping bags and stock up on protein bars NOW"? Well, looks like that slumber party's a bust. 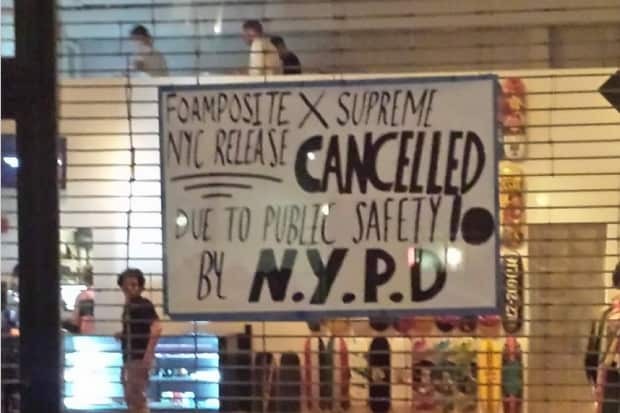 The New York's SoHo store tonight got so crazy -- with sneakerheads and resellers crowding not only the sidewalks, but spilling into busy Lafayette St, too -- that the NYPD deemed the scene a "public safety concern" and shut down the in-store launch. There's no word yet on the the rest of the scheduled in-store drops (Dover St. Market in New York, LA and London), but we will be sure to keep you updated.